View the full article by clicking here. Partner of Panish Shea & Boyle LLP, Brian Panish has been recognized for his 18-year consecutive win streak as a trial lawyer and “fierce competitor” in Southern California’s Best Lawyers 2011 publication as a “Cover Spotlight.” Mr. Panish has dedicated his career to representing individuals who have been injured or lost a loved one due to another party’s negligence or intentional wrongdoing. 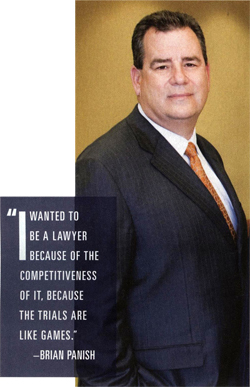 In reflecting on why he wanted to be an attorney, Mr. Panish told Best Lawyers that the competitiveness of law drew him in, yet he says that as a competitor, he’s “had to kind of dial it back and realize, you don’t always have to win.” Yet, this is what Mr. Panish continues to consistently do for his clients. Mr. Panish began setting records in high school as a competitive player on football, basketball, and baseball teams. He attended Fresno State on a football scholarship where he played for the school and was named a Fresno State 2010 outstanding alumnus during the school’s centennial celebration this year. Mr. Panish is also acknowledged in the article for obtaining groundbreaking verdicts, including three of the four jury awards in California’s legal history that exceed $50 million in compensatory damages. Mr. Panish was also recently recognized by the California chapter of the American Board of Trial Advocates as Lawyer of the Year, and received the third highest number of votes in the 2010 list of Top 10 Southern California Super Lawyers.